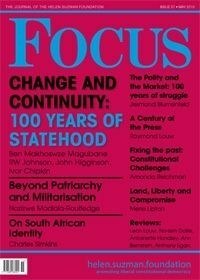 This edition of Focus is dedicated to a series of reflections about 100 years of statehood in South Africa. In my invitation to contributors, I pointed out that the political events which led to Union are well documented and widely known; so was the deliberate marginalisation of the majority of South Africans during the deliberations that led to the establishment of Union in 1910. Indeed, it was this marginalisation which led to the formation of the ANC in 1912, and it was only after some 84 years after the foundation of the state, that a constitutional and political ‘normalisation’ and legitimacy were achieved. From Union to a Democratic South Africa: Change and Continuity?